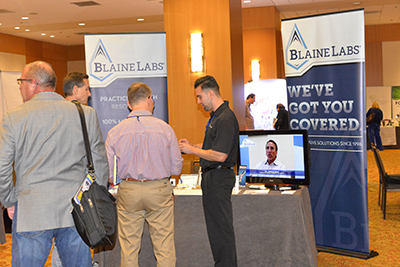 Thanks for your interest in being an exhibitor at the Annual Top Practices Marketing and Management Summit. If you would like to become an exhibitor, please complete the online Exhibitor Registration. You may also register by fax using this form. 1. The seminar will take place September 13th, 14th, and 15th at the San Antonio Marriott Riverwalk in San Antonio, Texas. You can book your room by clicking here. Please book your rooms early! 2. Registration for exhibitors will take place on Friday, September 13 from 2:00pm - 4:00pm. Attendees of the conference will begin registration at 4:00pm, so if you would like to have time to set up, please arrive early. 3. You can click here to view the schedule of the conference. 4. Tear-down hours for exhibitors will take place on Sunday, September 15th after 1:30pm. Please note that the Summit ends at 3:30pm, so please try to stay as long as possible. However, we understand that scheduling flights can be difficult. Q: What are the dimensions of the exhibitor area? You receive a six-foot skirted table for your booth with two chairs. Typically, there is about a foot of space between each exhibitor area. Q: How many are attending? We are expecting around 300 people to attend this year's Summit.